Winning an academy award is no different from winning an election in any mature democracy. You have to a) appeal to an electorate that skews old and is conservative with a small “c” and b) spend a ton of money on advertising. And, just as in a normal election, the best man (read integrity, vision, talent) rarely wins. Rather, the film that wins is typically the most banal, the least offensive, that harkens back to some mythical golden age – with Harvey Weinstein taking the role of Karl Rove, blanket-bombing DVD screeners and arranging friendly articles in the trade mags. How else do you explain DR STRANGELOVE losing to MY FAIR LADY? The triumph of SHAKESPEARE IN LOVE and DRIVING MISS DAISY? Or BROKEBACK MOUNTAIN being snubbed? Still, for all that, the Oscars do matter, just not as arbiters of taste. 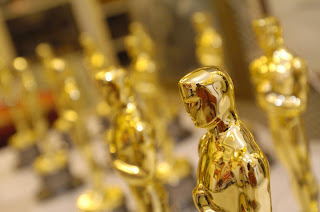 Rather, they matter because an Oscar nomination, let alone a win, undoubtedly boosts the box office of the winning films, and adds a million or so to the salary of the individual winners. And as we here at Movie Reviews for Greedy Capitalist Bastards are all about the phat cash, it would be hypocritical not to admire someone like Harvey Weinstein who so brilliantly games the system. Any investment banking analyst looking to corner the bonus pool could do worse than study his playbook. Bearing all this in mind, it comes as no surprise that the Academy has narcissistically and indulgently nominated movies that are nostalgic for the history of cinema – HUGO (11 nominations); THE ARTIST (10 nominations) and MY WEEK WITH MARILYN (2 nominations) – the latter two also pimped out by Harvey. HUGO is a particularly commercial pick, as the movie involved a respected auteur using 3D, a technology that badly needs reinvigorating and upon which the studios are depending to stymie piracy and boost ticket prices. It also comes as no surprise to see the Academy overlook provocative, daring, pioneering movies such as SHAME, DRIVE and TYRANOSSAUR, not to mention compelling performances from Michael Fassbender in SHAME, Albert Brooks and Ryan Gosling in DRIVE, Olivia Colman in TYRANOSSAUR, Tilda Swinton in WE NEED TO TALK ABOUT KEVIN, Vanessa Redgrave in CORIOLANUS... And in the documentary category, where is SENNA? The full list of nominations is below. I have underlined those that I think will win. I suspect THE ARTIST will pip HUGO at the post in the major categories, but that as with THE AVIATOR, Scorsese will be fobbed off with all the technical awards, except for a couple handed out as “end of series” commemorations to HARRY POTTER. I haven’t bothered indicating who I think should win, as so few of the nominees would make my final cut. Most of the people and films here are harmless. But I do find the nominations for THE GIRL WITH THE DRAGON TATTOO, THE DESCENDENTS, WAR HORSE and MONEY BALL particularly wrong-headed. In terms of positive surprises, it was good to see Woody Allen get a directing and Best Picture nom for MIDNIGHT IN PARIS. Overall though, one can but think this is a pretty mediocre list coloured by the Academy’s nostalgia and narcissism. In twenty years time, I suspect the only three films that people will still be watching will be SHAME, TREE OF LIFE and A SEPARATION. The rest is just food for worms. Costume design: Anonymous; The Artist; Hugo; Jane Eyre; W.E.